It’s another Frugal Fashion Friday. If you don’t live (or you are not from) Florida, you might not know how hot Disney can be during summer. We put together the perfect outfit to keep you cool and active, so no matter the temperature, it’s the BEST DAY EVER! 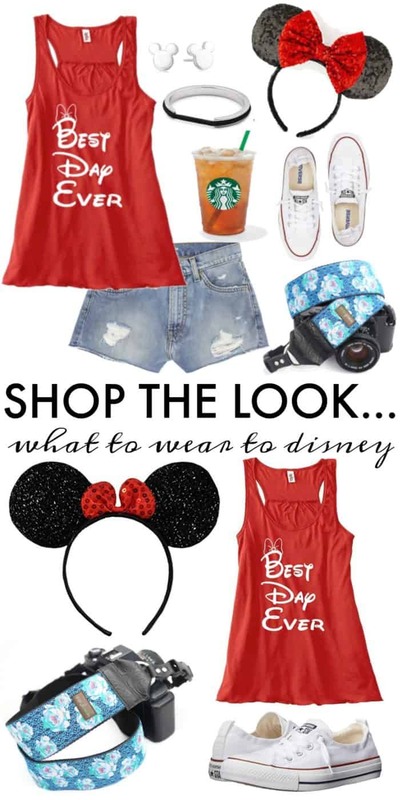 Of course Disney isn’t perfected without a cool refreshing drink, camera, and something festive on your head! Happy travels. 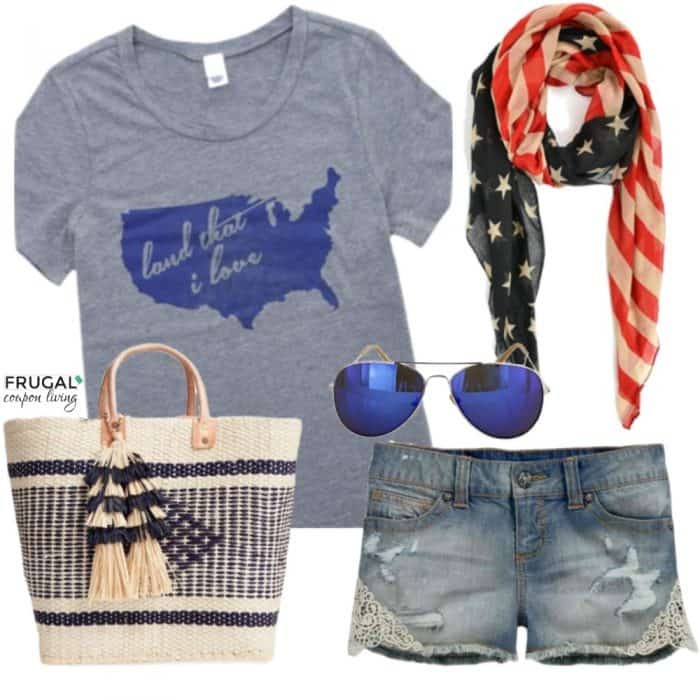 Don’t forget last week’s Frugal Fashion Friday Outfit, the Celebrity Inspired Beach Outfit – Pin It. Take us to the beach this Frugal Fashion Friday. Looking for some celebrity inspiration this summer? We have got the look for you next time you are the beach. First, these criss-cross top bikini tops are all the rage. They are adorable and very popular this season. Additionally, grab a cheap cover-up you can toss in your hand bag. We love this flowing, floral kimono. Pair with our favorite beach accessory – a fedora – and add some trending shades! All these little touches and you will look like a celebrity on the sand! 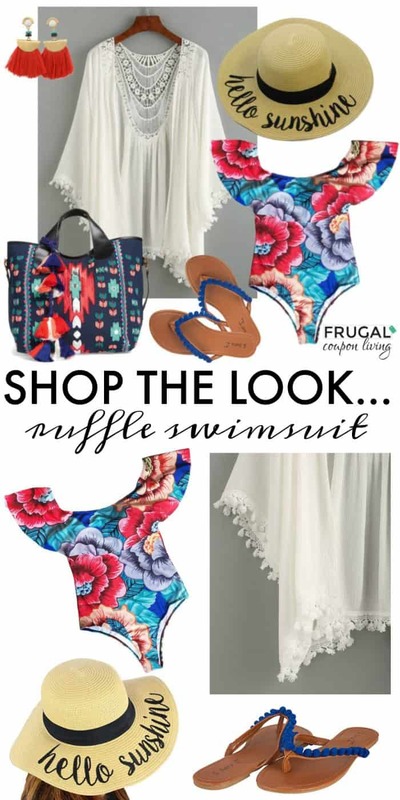 Don’t forget last week’s Frugal Fashion Friday Outfit, the Ruffle Swim Suit Outfit – Pin It. Take us to the beach this Frugal Fashion Friday. 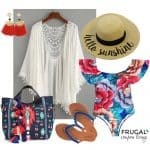 We found a festive and fun Ruffle Swimsuit and created a beach outfit so you are styling with your toes in the sand! We paired it with some current trends including tassel earrings, pom pom sandals, and a bright stand out bag. Life wouldn’t be grand without this straw Hello Sunshine hat! Simone Floral Ruffle Swimsuit – We found a similar one here! 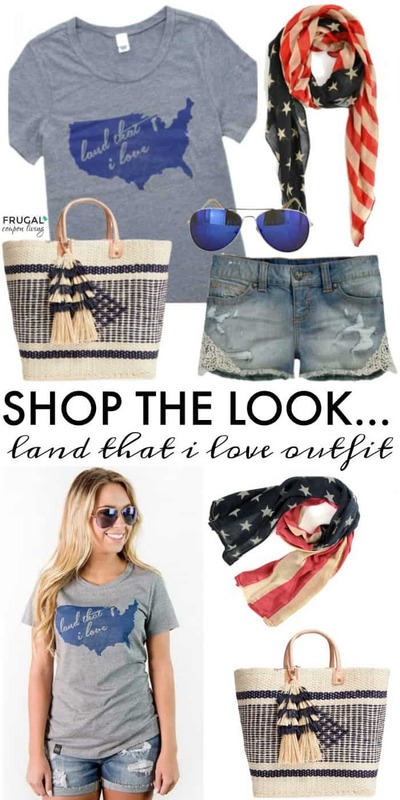 Don’t forget last week’s Frugal Fashion Friday Outfit, the Land That I Love Outfit – Pin It. It’s another Frugal Fashion Friday Outfit. We are feeling the feels of America and everything red, white and blue. 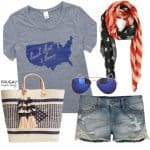 Whatever your Fourth of July plans, from the park to the lake, to an outdoor concert, we have a relaxed outfit for you. 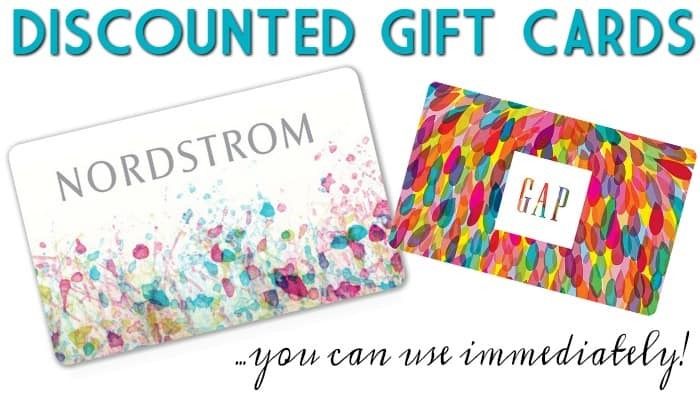 We find all of the pieces affordable and fun! Happy 4th! Land That I Love Graphic T-Shirt – Just for you! Get this Land that I Love T-Shirt for 40% off with code FRUGALLAND. Code expires 6/9/17. Blue Maverick Aviator Sunglasses – Just for you! Get these Aviator Sunglasses for 40% off with code FRUGALLAND. Code expires 6/9/17. 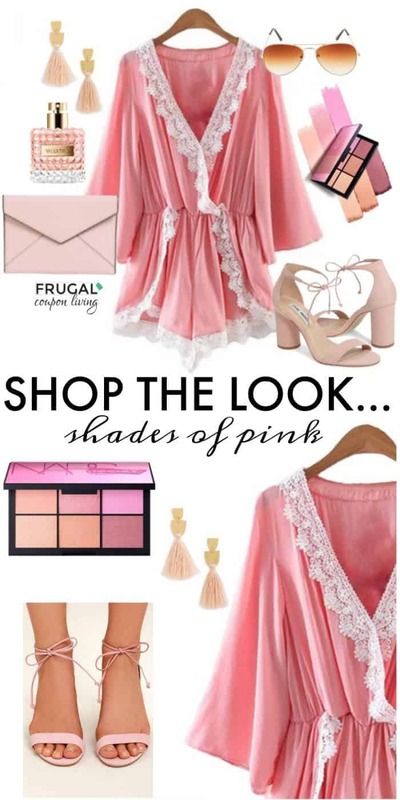 Don’t forget last week’s Frugal Fashion Friday Outfit, the Shades of Pink Outfit – Pin It. It’s another Frugal Fashion Friday Outfit. Summer has it and we are inspired by tanned skinned and shades of pink (hopefully not on your shoulders!) We fell in love with this Lace-Edged Romper in Pink and had to pair some things with it. Stand out with these block heel sandals, an adorable Rebecca Minkoff Clutch and fringe earrings. Don’t forget to put on your favorite fragrance! 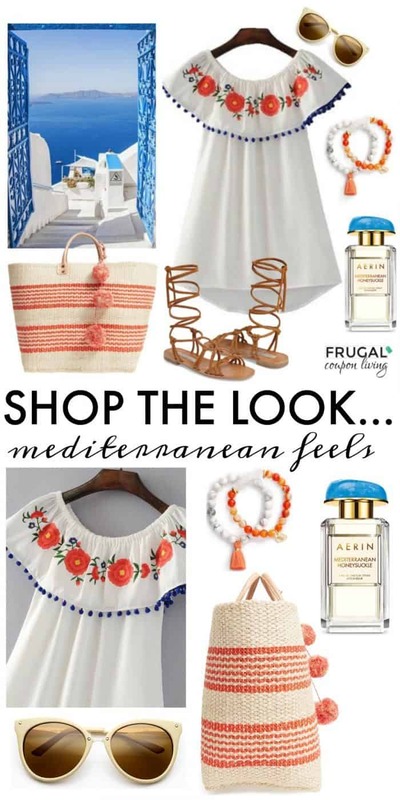 Don’t forget last week’s Frugal Fashion Friday Outfit, the Mediterranean Feels Outfit – Pin It. What to wear to Greece? Well it’s another Frugal Fashion Friday Outfit and we are going to tell you! When leaving on your next adventure, take a look at this outfit we paired together for Greece. This Mediterranean look is giving us some true love over a short airy linen dress, gladiator sandals, a carry-all tote, and some sunnies to feel like a celebrity that doesn’t want to be seen. Escape to a landscape of white buildings and a sea full of the deepest of blues. Enjoy you trip! 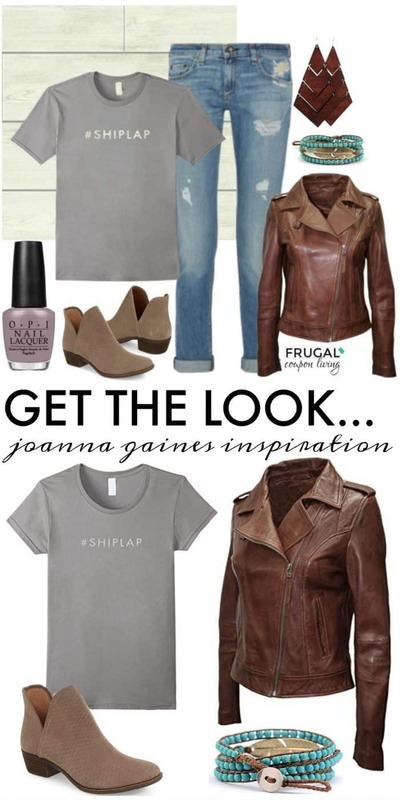 Don’t forget last week’s Frugal Fashion Friday Outfit, the Joanna Gaines Inspired Outfit – Pin It. It’s another Frugal Fashion Friday Outfit. We love us some Joanna Gaines and all things fixer upper she brings! 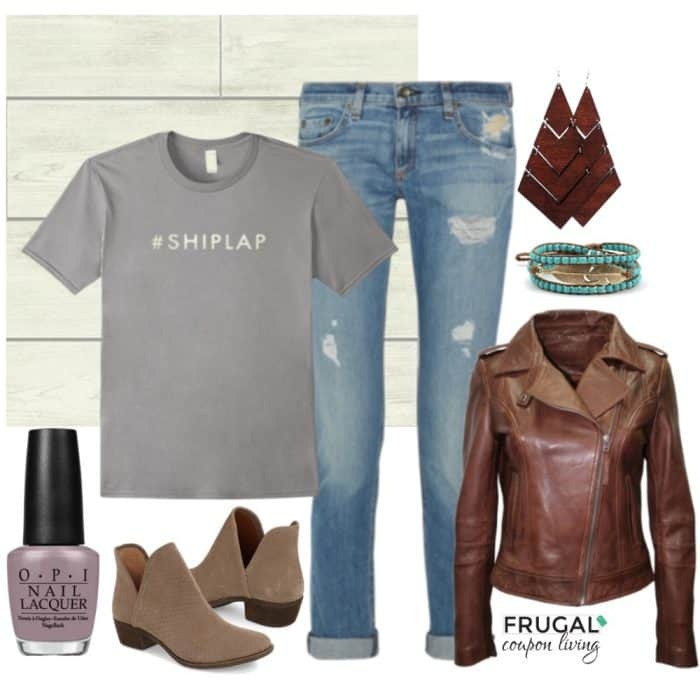 Today our outfit is inspired by everything Joanna… from the #shiplap tee, to the wooden earrings, adorable booties, and relaxed leather coat. We paired with your favorite distressed jeans, a fun bracelet, and a touch of gray on the nails. Now off to demolition day! 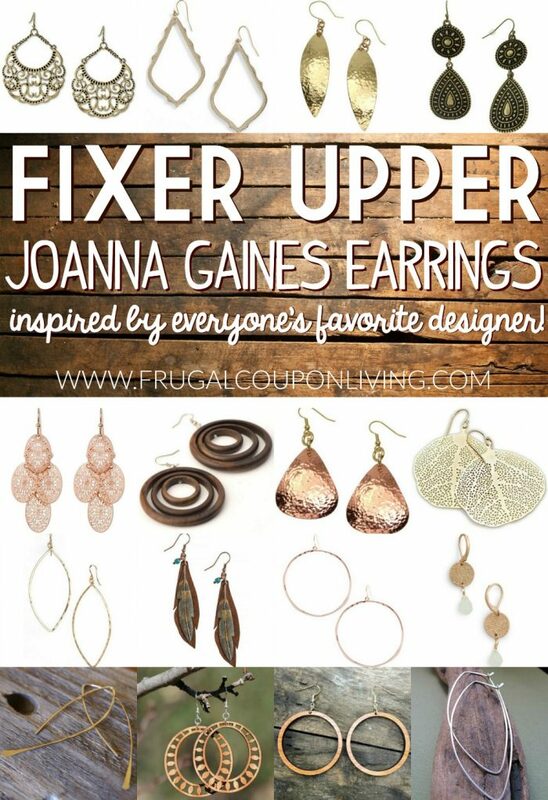 Also take a look at our Joanna Gaines Inspired Earrings. Pin to Pinterest. 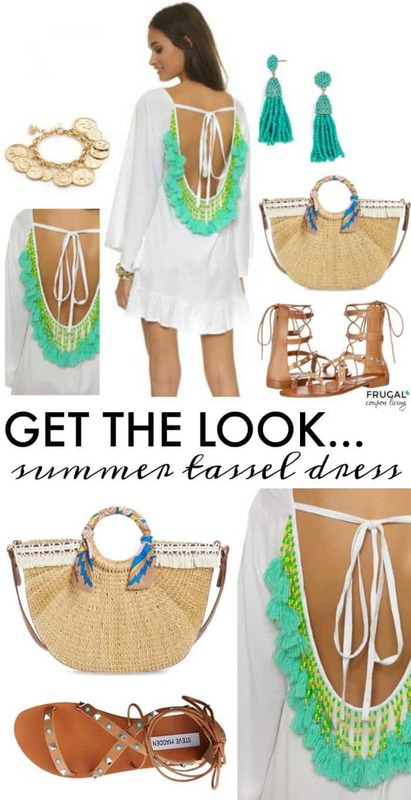 Don’t forget last week’s Frugal Fashion Friday Outfit, the Summer Tassel Dress Outfit – Pin It! It’s another Frugal Fashion Friday Outfit. One summer trend you must try are tassels? How fun is the back of this Tassel dress is white Tourquoise from ShopBop? We paired it with some tassel earrings from Nordstrom, and how about those Steve Madden Gladiator Sandals – do the studs remind you of another famous designer! I simply love them! Don’t forget last week’s Frugal Fashion Friday Outfit, the Aloha Vibes – Pin It.